Hey everybody. James here from All American Guardian.com. I just want to take a few minutes to talk about the difference between WordPress.com and WordPress.org. OK. They’re virtually the same thing except for WordPress dot com is hosted on their servers and you get less options. Basically you’re not as in full control as you are with the WordPress dot org self-hosted version of WordPress. They’re both WordPress. You can both, you know you can build a Web site on either one of these platforms. You can do a blog whatever you want to do but the WordPress dot com is kind of an easier less technical way to build a Web site. They do have a free version of this which is why a lot of people start out with it. Let me go with plans somewhere in here I’ll show you. Pricing. Okay so there is a free version so you can literally start a website completely free but you’re going to have a WordPress dot com subdomain. So what that means is you’re going to have let me see if I can find one. Let me just type in a common word like fast cars dot WordPress dot com OK. So this is just a really basic blog. But just to give you an example right up here and that you are able to see that it’s a WordPress dot com you R-AL it just got a subdomain with whatever your website name is so it be fast cars that WordPress dot com you know for a stay at home mom or just somebody that’s not really into business and you just want it easy. And not have to spend any money. This can be a good way to go but for an actual business Web site you do not want to have to you know put WordPress dot com in your your apple and put that on your business cards and things like that is just not as professional and it’s not as customized so another thing is that there’s advertisements that show up. OK. This whole thing right here. Let’s see if I can this blue squares an advertisement. This is an advertisement. This is an advertisement. You do not want other people’s businesses being advertised on your Web site that you don’t have control over you know if you want to put a web an advertisement for a local business that you know a friend or something trying to give them some business. That’s cool. But when you have a free or press dot com website or blog they actually just put these ads on here and you don’t really have control over what they’re putting. So again this is where press dot com is of the free way to start Web site. But there’s restrictions. You’re not going to have your customized domain for free. You’re going to have ads showing up on your site and also on the back end of WordPress and the dashboard. You have a lot less options to customize things like your theme. They do on WordPress dot com have ways to get a customized domain. See right here on these next three packages they are customizable and it starts giving you more and more design customization you see here when you get to the Third Package. You have unlimited premium themes and also advance design customization but that’s when you’re going to start paying. And if you’re going to pay for a or even they have a plan that’s twenty five dollars per month. You’re going to be paying that monthly. You might as well just be paying for your domain name and your custom domain name from like Namecheap. And also your Web site hosting that’s you know five 10 15 bucks a month if you’re going to be paying. So now let’s go look at where Prescott or which is what I suggest you use this click office wear press dot com. So we’re Prescott or it says democratized publishing the freedom to build the freedom to change the freedom to share. So what’s awesome about WordPress or the software that runs WordPress dot org. This version of WordPress is that these four freedoms apply to the software itself. I’m just going to read them out loud to run the program for any purpose saying do whatever you want with it. And build any kind of website to study how the program works and to change it and make it do what you wish. So you can completely customize the code to read redistributed and to distribute copies of your modified versions to others. So you’ve got something called GPL, General Public License associated with this particular version of WordPress. You can do whatever you want with it you can customize it you can install plugins you can make your own software out of it. I mean you’ve got full range of whatever you want to do to be creative and and you’ve just got unlimited options with this. Now the ways to install this version of WordPress that were Prescott or version is you can go to WordPress dot org. Click on download WordPress. This is kind of the old fashioned way of doing it. You can download WordPress. It comes in a zip file. Then you have to upload that to your server to get it onto your website. The easy way is the way that I showed you in a previous video which is using soft tackles. So soft tackle this is like an apps installer that comes already on for free on most Web hosting services the ones that I recommend to the InMotion Hosting and the Downtown Host. Both of those have soft tackles and I went through that in another video just to show you how to install that. 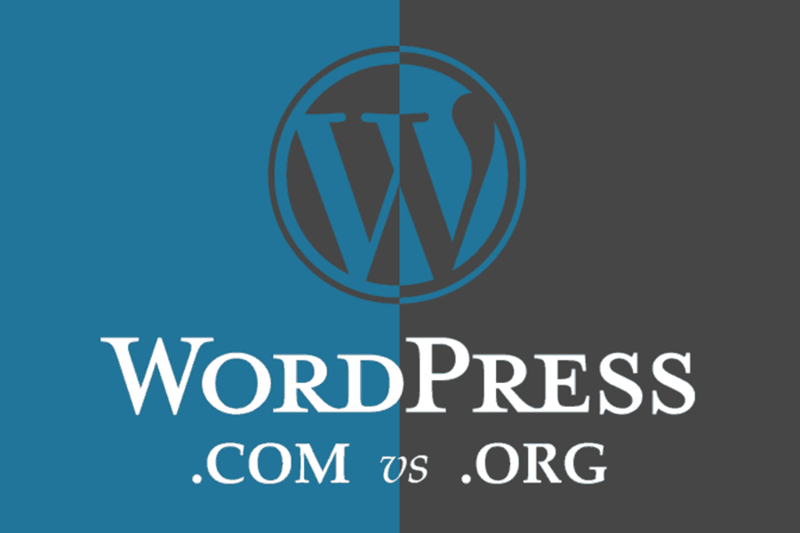 So that’s the main differences between WordPress com WordPress or what I suggest for business use for your website to use WordPress dot org. And like I said you can download that download that and upload it to your website the old fashioned way by visiting WordPress dot org or you can just do it from within your your Cpanel on your Web hosting service by going to the Softaculous icon down at the bottom. Kind of down towards the bottom right and within a few clicks you’ve got it installed on your website. You can also delete it very easily from there if you ever want to get rid of it so that’s it. That’s the main differences between WordPress icon and WordPress dot org if you have any questions leave them in the comments below and I will see you on the next video.